The plasma membrane serves as a barrier between the cell and its environment. Nevertheless, nutrients, oxygen, and many other substances needed by the cell must be taken in and waste products must be eliminated. Clearly, some substances can be exchanged between the cell and its environment through the plasma membrane. For this reason, the plasma membrane is described at a simple level as semipermeable. It is permeable, or passable, to some molecules but impassable to others. Some particles, proteins for example, are too large to travel through the membrane unaided. The ability of a substance to travel through the membrane is based on several factors. Molecular size is the main factor that determines passage through the membrane, but solubility and electrical charge are also considerations. Water, a tiny molecule, is usually able to penetrate the membrane with ease. Nutrients, however, must be split into small molecules by the process of digestion so that they can travel through the plasma membrane. Sucrose (table sugar), for example, is converted to glucose and fructose, smaller molecules that enter the cell and serve as sources of energy. Various physical processes are involved in exchanges through the plasma membrane. One way of grouping these processes is according to whether they do or do not require cellular energy. * Diffusion is the constant movement of particles from a region of relatively higher concentration to one of lower concentration. Just as couples on a crowded dance floor spread out into all the available space to avoid hitting other dancers, diffusing substances spread throughout their available space until their concentration everywhere is the same-that is, they reach equilibrium (Fig. 10). This movement from higher to lower concentrations uses the internal energy of the particles and does not require cellular energy, just as a sled will move from the top to the bottom of a snowy hill. The particles are said to follow their concentration gradient from higher concentration to lower concentration. When substances diffuse through a membrane, such as the intact plasma membrane, passage is limited to those particles small enough to pass through spaces between molecules in the membrane, as shown with a large-scale example in Figure 11. In the body, soluble materials, such as nutrients, electrolytes, gases, and waste materials, are constantly moving into or out of the cells by diffusion. * Osmosis is a special type of diffusion. The term applies specifically to the diffusion of water through a semipermeable membrane. The water molecules move, as expected, from an area where there are more of them to an area where there are fewer of them. Figure 10 Diffusion of a solid in a liquid. The molecules of the solid tend to spread evenly throughout the liquid as they dissolve. Figure 11 Diffusion through a semipermeable membrane. 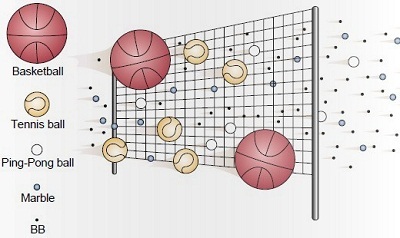 In this example, large objects (basketballs, tennis balls) cannot pass through the net, whereas the smaller ones (ping-pong balls, marbles, BBs) can. In the human body, large particles in the blood, such as proteins and blood cells, cannot pass through the walls of the capillaries, whereas small particles, such as nutrients, electrolytes, and gases can. That is, the solvent (the water molecules) moves from an area of lower solute concentration to an area of higher solute concentration (Fig. 12). For a physiologist studying the flow of water across membranes, as in exchange of fluids through capillaries in the circulation, it is helpful to know the direction in which water will flow and at what rate it will move. A measure of the force driving osmosis is called the osmotic pressure. This force can be measured, as illustrated in (Fig. 13), by applying enough pressure to the surface of a liquid to stop the inward flow of water by osmosis. The pressure needed to counteract osmosis is the osmotic pressure. In practice, the term osmotic pressure is used to describe the tendency of a solution to draw water into it. This force is directly related to concentration: the higher the concentration of a solution, the greater is its tendency to draw water in. * Filtration is the passage of water containing dissolved materials through a membrane as a result of a mechanical (“pushing”) force on one side (Fig. 14). One example of filtration in the body is the movement of materials out of the capillaries and into the tissues under the force of blood pressure. Another example occurs in the kidneys as materials are filtered out of the blood in the first step of urine formation. * Facilitated diffusion is the movement of materials across the plasma membrane in the direction of the concentration gradient (from higher to lower concentration) but using transporters to move the material at a faster rate (Fig. 15). Glucose, the sugar that is the main energy source for cells, moves through the plasma membrane by means of facilitated diffusion. Figure 12 A simple demonstration of osmosis. Solute molecules are shown in yellow. All of the solvent (blue) is composed of water molecules. (A) Two solutions with different concentrations of solute are separated by a semipermeable membrane. Water can flow through the membrane, but the solute cannot. (B) Water flows into the more concentrated solution, raising the level of the liquid in that side. Figure 13 Osmotic pressure. 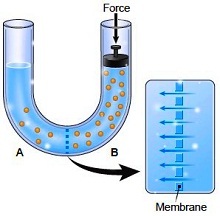 Osmotic pressure is the force needed to stop the flow of water by osmosis. 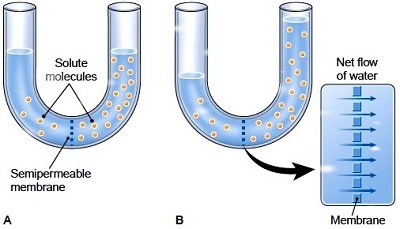 Pressure on the surface of the fluid in side B counteracts the osmotic flow of water from side A to side B. Figure 14 Filtration. A mechanical force pushes a substance through a membrane, although the membrane limits which particles can pass through based on size. The small particles go through the membrane and appear in the filtered solution (filtrate). Figure 15 Facilitated diffusion. Transporters (proteins in the plasma membrane) move solute particles through a membrane from an area of higher concentration to an area of lower concentration. (A) A solute particle enters the transporter. (B) The transporter changes shape. 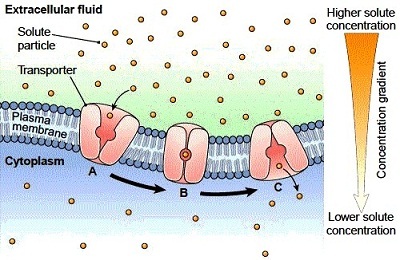 (C) The transporter releases the solute particle on the other side of the membrane. * Active transport. The plasma membrane has the ability to move small solute particles into or out of the cell opposite to the direction in which they would normally flow by diffusion. That is, the membrane moves them against the concentration gradient from an area where they are in relatively lower concentration to an area where they are in higher concentration. Because this movement goes against the natural flow of particles, it requires energy, just as getting a sled to the top of a hill requires energy. It also requires proteins in the cell membrane that act as transporters for the particles. This process of active transport is one important function of the living cell membrane. The nervous system and muscular system, for example, depend on the active transport of sodium, potassium, and calcium ions for proper function. The kidneys also carry out active transport in regulating the composition of urine. By means of active transport, the cell can take in what it needs from the surrounding fluids and remove materials from the cell. Because the cell membrane can carry on active transport, the membrane is most accurately described, not as simply semipermeable, but as selectively permeable. It regulates what can enter and leave based on the needs of the cell. There are several active methods for moving large quantities of material into or out of the cell. These methods are grouped together as bulk transport, because of the amounts of material moved, or vesicular transport, because small bubbles, or vesicles, are needed for the processes. * Endocytosis is a term that describes the bulk movement of materials into the cell. * In phagocytosis, relatively large particles are engulfed by the plasma membrane and moved into the cell (Fig. 16). Certain white blood cells carry out phagocytosis to rid the body of foreign material and dead cells. Material taken into a cell by phagocytosis is first enclosed in a vesicle made from the plasma membrane and is later destroyed by lysosomes. * In exocytosis, the cell moves materials out in vesicles (Fig. 17). One example of exocytosis is the export of neurotransmitters from neurons (neurotransmitters are chemicals that control the activity of the nervous system). Figure 16 Phagocytosis. The plasma membrane encloses a particle from the extracellular fluid. 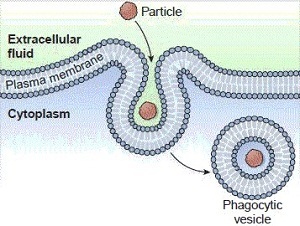 The membrane then pinches off, forming a vesicle that carries the particle into the cytoplasm. Figure 17 Exocytosis. 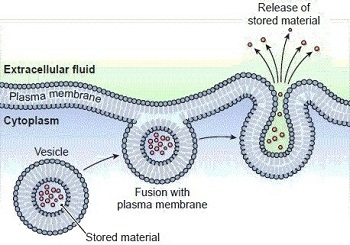 A vesicle fuses with the plasma membrane then ruptures and releases its contents.